New Year's Eve party centerpieces should be festive and eye-catching. No matter which type of party you're hosting, there are fun centerpieces you can put together to help usher in another new year. While centerpieces can be extremely fancy, sometimes it's best to keep it simple. Here are some ideas for attractive arrangements that you can put together quickly and easily. Another option is to fill large bowls with brightly colored noisemakers and other party favors so they are readily available when the clock strikes midnight. A champagne bucket, traditionally used to keep bottles of bubbly well-chilled, is another perfect start to pretty New Year's Eve party centerpieces. These containers come in a wide variety of styles, and you can usually find them at a reasonable price at any department store. To turn the bucket into a centerpiece, fill it about half-way full with glass beads or marbles. Take an empty champagne bottle and, using a hot glue gun, attach strings of wired tinsel or foil ribbon to the inside of the bottle mouth. The ribbon or tinsel should appear to be flowing out of the bottle like sparkling champagne. You can also add a colorful bow to the bottle's neck. Nestle the decorated bottle into the marbles or glass in the champagne bucket. If you're looking for a really quick and simple centerpiece idea, a candle placed on a mirror is always a great option. Mirrors reflect the glow of the candle flames, giving off a warm glow that seems to extend well past the centerpiece itself. Use small mirrors or mirrored tiles to place votives or tea lights on, or sit a pillar candle on a larger mirror. Accent the centerpiece with flowers, noisemakers or other decorative items if you wish. Top hats are symbolic of dressing up for a formal New Year's Eve party, but you can use them as part of your decorating theme even if your gathering is a casual one. Use a real or plastic top hat and turn it upside down. Line the inside with some colored tissue paper, letting the tips of the paper stick up a bit over the brim of the hat. Tie colored ribbons to a few helium balloons, and weigh them down by tying the ends of the ribbons to something heavy, like a paperweight. Place the paperweight in the top hat, and fill with colorful confetti. If you're not in the mood to create your own centerpiece, you can purchase a wide range of different decorations that will suit your party. Here are a few that are fun and different. Ice Crystal Centerpiece with Glass Globe - This silver and crystal centerpiece will add a touch of old man winter to a classy celebration. The wreath is made to fit around a glass globe that you can use for a candle. Fiber Optic Pyramid - If you really want to draw some attention to your table, these fiber optic blinking lights should do the trick! They're fun and festive, and inexpensive enough that you can decorate several tables with them. One of the great things about a New Year's Eve party is that you don't really need a theme. 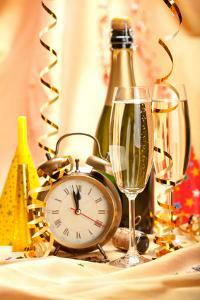 Ringing in the new year is reason enough for the celebration, and decorations can be kept simple. Whether you opt for colorful, casual fun or a more elegant display, the table centerpiece should reflect the tone of the party.